The rising use of cloud-based applications is identified as one of the chief drivers of the global cognitive computing market. Cognitive computing has delivered exceptional business and societal benefits by automating tabulation and harnessing computational processing and processing. These developments have in turn helped businesses deliver enterprise and personal productivity. Cognitive systems enable people interact with other computing systems and extend their expertise across any domain of knowledge. Thus is supports making complex decisions involving extraordinary volumes of fast moving big data. Cognitive system uses natural language processing and machine learning to enable people and machines interact more easily. These systems learn and interact to provide expert assistance to scientists, engineers, lawyers, and other professionals in a fraction of the time. In 2016, the global cognitive computing market was valued at US$29.67 bn and is expected to reach US$1,000.52 bn by 2025, expanding at a CAGR of 49.9% during the forecast period. Though high upfront investment for the companies may act as a restrain for cognitive computing market as it is difficult for many cognitive technology companies to draw pilot stage funds for R&D. Nonetheless, the increasing demand from Healthcare sector due to rising amount of unstructured data serves as an opportunity for the market. Moreover, increasing demand for next generation cognitive data centers also act as an opportunity for the global cognitive computing market. Based on deployment type, the global cognitive computing market has been segmented into on-premise and cloud. The cloud segment held the largest share in 2016, contributing nearly 65.4% to revenue generated by the global market revenue share. The segment is also expected to report a higher CAGR, thus remaining the market lead through the forecast period. In terms of application, the market is classified into diagnostic API’s, robotics, cyber security, farm mechanization, social media monitoring, self-driving cars, gaming, video surveillance, E-learning, IT infrastructure management, supply chain management, and others. By industry vertical, healthcare, BFSI, it & telecom, manufacturing, energy & utility, retail, aerospace & defense, government, transportation, agriculture, media & entertainment, education, HR, and marketing & PR have been exhibiting considerably high demand for cognitive computing. Of these, the healthcare industry held the dominant market share in 2016. Based on the end-user, the market is categorized as large enterprises, small & medium enterprises and public sector. Of these, holding a share of nearly 49.8% of the market, large enterprises emerged as the dominant segment in 2016. The segment is forecast to remain dominant through the course of the forecast period. Regionally, Asia Pacific, South America, North America, Europe, and the Middle East & Africa constituted the key market segments. Among these regions, North America held dominance in 2016. However, during the course of the forecast period, the Middle East & Africa market is likely to offer more lucrative prospects. In North America, the market is gaining from the high deployment of cognitive computing across educational institutions and various small & medium enterprises. As the technology reduces the burden of hardware installation and maintenance for organization, it is expected to continue witnessing rising demand through the forecast period. While the market is forecast to witness strong demand across the world, its growth in Asia Pacific and the Middle East & Africa will be exemplary. In Asia Pacific, the cyber security application segment will emerge as one of the prime end users of cognitive computing. In the Middle East & Africa, the cognitive computing market will witness rise in deployment at a CAGR of 53.2% between 2017 and 2025. The use of cognitive computing in infrastructure management applications is aiding the market’s expansion in the Middle East and Africa. The key market players profiled in this report are Cisco Systems, Inc., Hewlett Packard Enterprise, IBM Corporation, Flatiron Health, Inc., Accenture, Inc., Microsoft Corporation, SparkCognition, Google, Inc., Digital Reasoning Systems and Narrative Science. The market overview section of the report showcases the market dynamics and trends such as the drivers, restraints, and opportunities that influence the current nature and future status of this market. It also provides an overview about the key market indicators given across the five geographical regions. Under the porter’s five forces analysis section, a brief analysis of the level of competition within the cognitive computing industry and business strategy development is provided in order to determine the competitive attractiveness and intensity of the cognitive computing market. Reports also includes key industry developments covering significant advances made by leading market players. The report also provides the competitive landscape for the cognitive computing market, thereby listing out all the major players according to their geographic presence, market attractiveness and recent key developments. The competitive landscape section of the report gives an overview about the market share of several key players in the market for the year 2016. The cognitive computing market data estimates are the result of our in-depth secondary research, primary interviews and in-house expert panel reviews. These market estimates have been analyzed by taking into account the impact of different political, social, economic, technological, and legal factors along with the current market dynamics affecting the market growth. Moreover, key takeaways section provided at the end of competitive landscape section would help the operating companies to make the best move in this market. Based on different deployment type options for cognitive computing, the report segments the cognitive computing market into on-premise and cloud. On the basis of applications, the market has been segmented into diagnostic APIs, robots, cyber security, farm mechanization, social media monitoring, self-driving cars, gaming, video surveillance, eLearning, IT infrastructure management, supply chain management and others. Based on industry type, the cognitive computing market is divided into Healthcare, BFSI, IT & Telecom, Manufacturing, Energy & Utility, Retail, Aerospace & Defense, Government, Transportation, Agriculture, Media & Entertainment, Education and others (HR, Marketing & PR, etc.). Based on end-users, the market is classified into large enterprises, small & medium enterprises and public sectors. 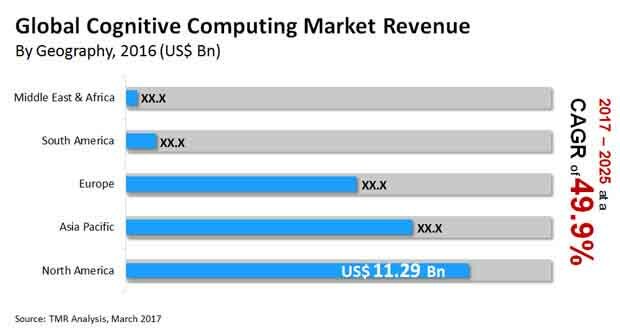 In terms of geography, the global cognitive computing market is classified into North America, Europe, Asia Pacific, Middle East & Africa, and South America. Cisco Systems, Inc., Hewlett Packard Enterprise, IBM Corporation, Flatiron Health, Inc., SparkCognition, Microsoft Corporation, Google, Inc., Digital Reasoning Systems, Narrative Science and Accenture, Inc. are few of the key players which have been profiled in this study. Details such as financials, business strategies, SWOT analysis, and other such strategic information pertaining to these players has been duly provided as part of company profiling.